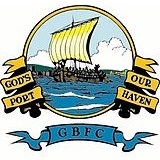 Hayes and Yeading United endured a difficult evening where not a lot went right, allowing Gosport Borough to cash in and claim the vital three points at Privett Park. 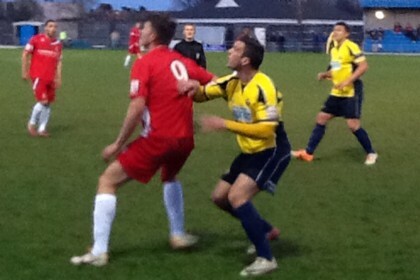 Borough started strongly. Dan Wooden fired a dipping volley just over the bar and then, under pressure, Rory Williams had an effort on target, but without sufficient power. 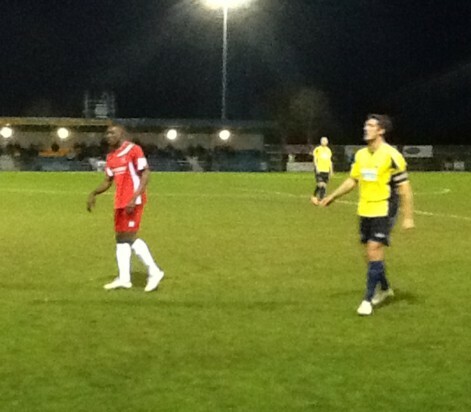 Freddie Ladapo responded by powering through the home defence, only to be blocked by Sam Pearce's desperate lunge. Pearce went close at the other end with a header from outside the box which Mikhael Jaimez-Ruiz saw drift safely wide, but on 19 minutes, the United keeper was a far more reluctant spectator as Wooden collected a square pass from Rory Williams on the left and planted a stunning volley beyond him and into the net. Justin Bennett collected Josh Carmichael's cut back and almost applied an immediate second, only for Ben Brown to block bravely. Unfortunately, the last thing United's defence needed was a necessary reorganisation, but an injury to Ben Gerring necessitated a change, Chimdi Akubuine replacing him and slotting in at right back with Ben Brown moving into the middle of the defence. United rallied. Andrew Musunga reacted quickly to his blocked shot by firing the rebound just over. However, Gosport's Andy Forbes had a weak long range shot comfortably fielded by Jaimez-Ruiz before an incredible miss from Wooden stunned everyone when he latched onto Carmichael's lay off but failed to turn the ball into the net from point blank range. The second half started slowly, but after Lee Molyneaux had miskicked in front of goal leaving Jaimez-Ruiz with a routine save, Borough doubled their lead when a seven pass move on the right hand side led to a speculative low shot from outside the area by Ryan Scott, which curled inside the far post. Following the second goal, there was then another long spell with a lot of combative play but little goalmouth action until the hosts scored again, a clever volleyed pass from Bennett releasing Rory Williams who also tucked his finish inside the far post. Despite this setback, United conjured their first chance of the second half when Luke Williams was brought down by Danny Smith just outside the box and Jack Mills curled the resulting free kick just over. However, despite United's best efforts, Gosport remained in control, cultivating further half chances for Bennett and Dan Woodward. Even when Pat Cox laid the ball off to Mills following a Musunga corner and a fierce shot looked like earning a consolation goal, Nathan Ashmore produced a superb reaction save to deny United even that. Report and photos by Nick Bell.